In recent days, regime forces have ramped up their deadly bombardment of southern Idlib, causing massive damage in the town, while sending reinforcements to nearby areas they control. Ankara has strongly voiced its humanitarian concerns over the recent escalation in violence in northwestern Syria's Idlib. Turkish officials also warned about the catastrophe that could arise if the town was to face heavy bombardment by forces loyal to Bashar Assad, without separating terrorist groups from moderate opposition. "It would be catastrophic to bomb the whole of Idlib; hospitals and schools [to kill terrorists]. The moderate opposition and terrorists need to be separated from each other," Foreign Minister Mevlüt Çavuşoğlu said at a press conference yesterday with his Russian counterpart Sergey Lavrov in Ankara. After retaking control of swathes of opposition-held territory in the Idlib region, the Bashar Assad regime recently signaled that the Idlib province, the last major bastion of Syria's political and military opposition, will be the main target. Naturally, this has raised concerns regarding the safety of civilians and the moderate opposition. Çavuşoğlu said that while estimations show that there are about 3 million civilians in the city, the presence of some terrorist groups is also a reality and that "these groups pose threats to the moderate opposition groups and civilians." The foreign minister added that what is being done there should be transparent and clear. "With a strategy aiming at results, we need to detect these terrorists and eliminate them with our partners, including Russia," he said. Last week, the Syrian regime dropped leaflets across the province urging residents to reconcile with its rule. Officials have warned that regime forces will take back the province by force if necessary. 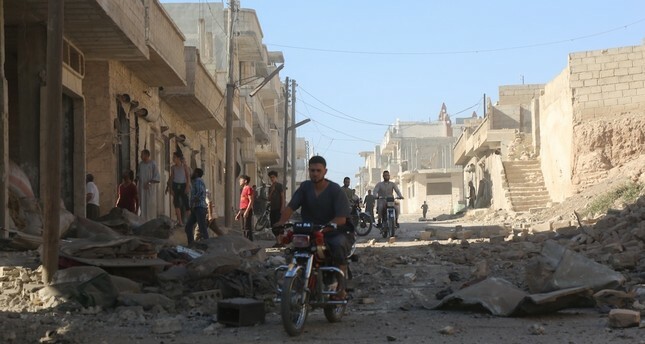 Idlib, located in northwestern Syria on the Turkish border, has been under the control of opposition groups since March 2015 and has been facing intense air raids by the Bashar Assad regime and its backers ever since. In an effort to restore calm in the region and improve the humanitarian situation in war-torn Syria, three guarantor states Turkey, Iran, and Russia launched the Astana process on Jan. 23, 2017, establishing de-escalation zones. "We have established 12 observation points. Their aim is to detect any violation of the cease-fire and as guarantor countries take necessary steps accordingly," the foreign minister said. Russia will continue to support AssadCommenting on the recent situation in Idlib, Lavrov said that "the Syrian army has been targeted particularly by the Nusra Front" and therefore it is Syria's right to protect itself and therefore Russia "can support it against these attacks." "The de-escalation zones were established based on some conditions. One of these conditions was that the cease-fire will not include the terrorists. The situation there is more difficult. The Nusra Front has thousands of militants there. The situation had calmed down when Turkey established observation points. However, recently the Syrian army has been subjected to some attacks. The Syrian army preserves the right to fight against these moves," Lavrov said. The U.N. children's agency, UNICEF, said last week that a battle for Syria's Idlib province between regime forces and the opposition could affect the lives of more than 1 million children, many of whom live in refugee camps. UNICEF said food, water, and medicine are already in short supply in the largely rural northwestern province, now home to over 1 million Syrians who have been displaced from their homes by regime offensives across the country. The agency said a battle for Idlib, would exacerbate an already dire humanitarian situation, and potentially displace 350,000 children. Other U.N. officials have also drawn attention to the issue recently, saying the possible attack on Idlib could lead to a new wave of refugees moving towards Turkey. Turkey, which has been hosting over 3.5 million Syrian refugees, calls on actors on the ground to take humanitarian concern into consideration before launching an offensive. Following Bashar Assad's statements on June 27 saying Idlib will be a top priority, Ankara had warned the regime and its allies to refrain from a possible offensive in the province. On the issue, President Recep Tayyip Erdoğan in July told reporters at the BRICS summit in Johannesburg, South Africa, that he personally asked Russian President Vladimir Putin to take necessary precautions against a possible regime attack on Idlib.